The remains of the magazine centre of the photo under the white cliffs of dover. 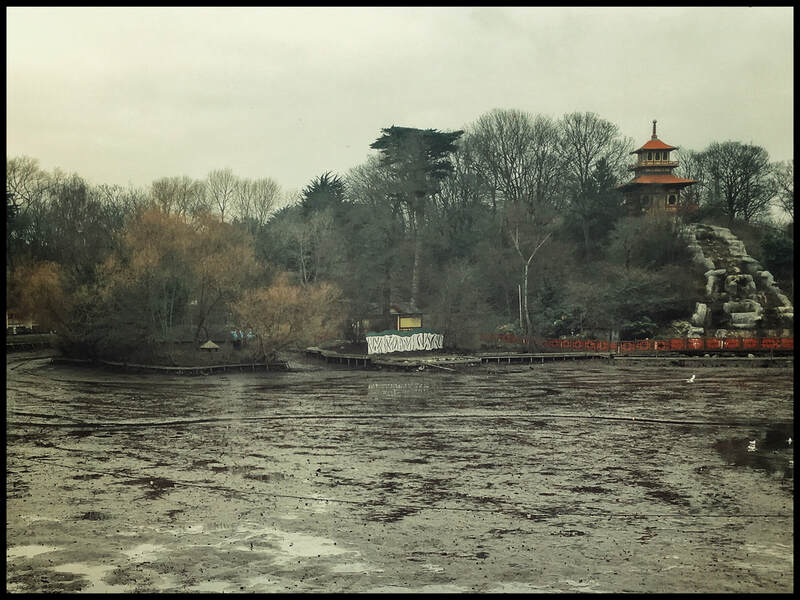 Photo taken 2018 when Peasholm Lake was drained for dredging. As a lad, I was told by my newsagent that John Menzies was the big magazine storage facility when I used to order my comics. The depot was down Mill Street, off Victoria Road in Scarborough. “Can you get Star Wars Weekly or Kung Fu Monthly?” I used to ask. “I’ll see if John Menzies can get hold of it for you”, they used to say. I used to imagine John Menzies to be like the warehouse at the end of the film Raiders of the Lost Ark, full to the brim of comics, all boxed up in a great big hanger. Now, when I think of magazine storage facilities, another one springs to mind, relating to a very different kind of magazine - a warehouse for storing military ammunition. It is from the old French for ‘store’ and has been used since the 14th century. It didn’t become associated with journals and periodicals until the 18th century. The 19th century antiquarian Robert Knox described the remains of a small building at the foot of the hill in Peasholm Park. This ruin, he explained, was what was left of Northstead Manor. He wrote: “A few yards south-west of the hill is a path and a ruined building which as Thomas Hinderwell related was a manor house. That, however, seems very questionable. It was more likely to have been a magazine”. Knox describes Peasholm Gap as an area of fortifications defending Scarborough from attack from the north. He states that this magazine and the surrounding ramparts are the reason why the big mound was known locally as Bunker Hill. He describes ramparts connecting the magazine with the top of Peasholm Hill and Peasholm Fort, a military building dating to the time of the civil war. Knox explains: “Originally these fortifications perhaps refer to a period far more remote in antiquity that that of Cromwell’s time, for this pass would be defended by the people who had to successively contend with assailants more fierce and barbarous than themselves”. Knox, who reckoned the ancient fortifications predated Scarborough castle, proposed that the hill which now has a pagoda be known as Old Castle-hill. But it didn’t really catch on. In a drawing he made in the 1850s, Knox shows a track that leads from the end of Greengate, an old name for North Marine Road. It cuts down the hill to where the boat landing is now on the lake. The track crossed the lake past the ruin of the magazine to where the penny well is today, near the little bridge on the other side of the lake. It then followed the current route up out of the park via the putting green to Northstead Manor Drive. Interestingly the track, if continued, would have connected with one of the High Peasholm tumuli that were on Ryndle Walk. The track may predate the parish boundary. At the other end of Greengate is St Thomas Street, named after the church of St Thomas the Martyr. With two hospitals of the same name, the church stood to the north side of the old bar, near where the pancake bell is rung today, at the Newborough end of North Street. St Thomas’s is the second magazine that springs to mind when I hear the words magazine facility. St Thomas the Martyr, or Thomas à Becket, was murdered in 1170 as a result of the misheard orders of Henry II after a bitter argument between cleric and king about the rights and privileges of the church. Henry II gave Scarborough its castle keep, built around 1169. St Thomas’s church, dedicated to Becket, was built not long after he was canonised as a martyr by the pope in 1173. Some 500 years later, both the castle keep and St Thomas’s chapel were destroyed in the civil war. St Thomas’s was founded in the 12th century by the town’s burgesses for the care of its young orphans and the infirm. Such tasks were recognised as necessary to maintain a healthy community even in the 12th century. The order of monks that ran the hospital and chapel preserved the ancient custom of ringing a bell at six o’clock every morning and in the evening. This bell has become the shriving or pancake bell which is still rung on Shrove Tuesday. The original bell is in the care of Scarborough Museums Trust. During the castle siege, St Thomas’s Church was converted into a magazine for storing military supplies by the Parliamentary forces under the command of Sir John Meldrum. Scarborough fell to the Parliamentarians on Shrove Tuesday 1645. St Thomas’s was demolished in 1649 after sustaining irreparable damage during the siege. What a coincidence that the castle keep and St Thomas’s Church were built and either wholly or partly destroyed at about the same time, 500 years later. At more or less the same time, Scarborough fell to the Parliamentarians on Shrove Tuesday and the St Thomas’s bell became the pancake bell we ring today. Such associations could be described as synchronicity, a term coined by Swiss psychologist Carl Jung to describe uncanny coincidences with no causal relationship. Masonry from the ruins of St Thomas’s Church was reused in the repairs to St Mary’s Church and can still be seen today.